Governments, politicians and businesses have to consider the effects of manufacturing on the environment. It is not only manufacturing processes that can alter our environment, such as pollution in the form of fumes and noise, but there are other considerations. When a factory is set up there will inevitably be more lorries transporting raw materials and the finished product to and from the factory. This can cause congestion in our towns and cities. It is very important for all of us, that industry takes care of the environment. In this way, you must consider a variety of measures, to reduce the adverse environmental effects that products you design and manufacture, may cause. 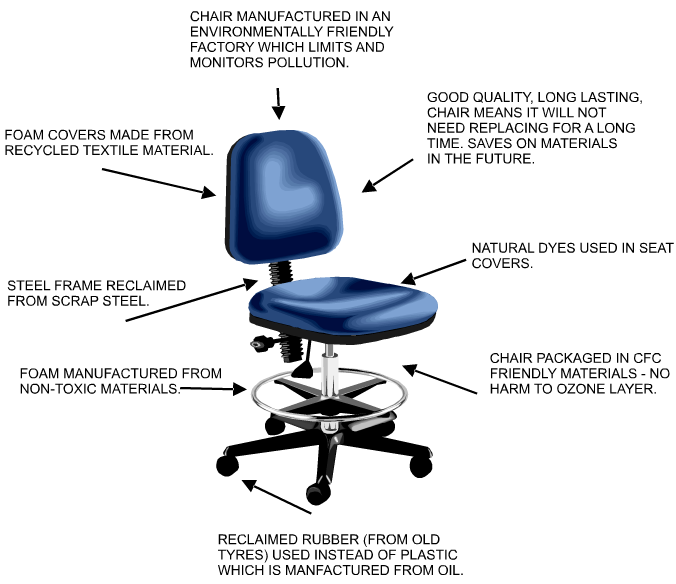 This chair (seen below) is a green product, in that it has been designed and then manufactured with the environment in mind. Every possibly action has been taken to reduce poor environmental effects. The chair is sturdy and will last twice as long as the average chair. In this way there will not be a need to replace it in the near future and materials will be saved. As far as possible, the materials that have been used, have been recycled from scrap / recyclable materials. Natural materials have been used, such as natural dyes which require only the minimum processing in a factory. The less processing, the less pollution. Most consumers are aware of environmental damage, caused by the manufacture of products they purchase. The majority of consumers are beginning to ask questions and make choices, about the products they buy, based on their knowledge of the environment. This is known as ‘Green Consumerism’. Marketing is now identifying the needs of the consumer. Consumers are demanding products that are less harmful to the environment. If manufacturers are to meet the environmental demands of consumers, they have to be aware of green issues and make sure that the products they design are friendly to the environment. When you design, keep the points mentioned above in mind. Mention them in the notes you place along side your drawings. Try referring to the importance of environmental considerations, when explaining your ideas, as these are issues that are always in the news. People today are well aware of the environment around them and tend to avoid products that harm it. When you design a product it is very important that you design it with the environment in mind. The environment is always in the news especially damage caused by pollution and the waste we produce (eg. excessive packaging). Pollution is caused by manufacturing techniques although with your careful and thoughtful design and planning damage to the environment / pollution and waste can be reduced. The example shown below shows a design drawn in the centre of the page and environmental aspects arranged around it. 1. The design should be clear and the paragraphs kept simple and easy to understand. 2. Write a paragraph underneath each heading. Refer to your project in each of the paragraphs. 3. You may wish to add small diagrams/pictures. For instance, include logos / symbols representing recycling and energy conservation. 4. 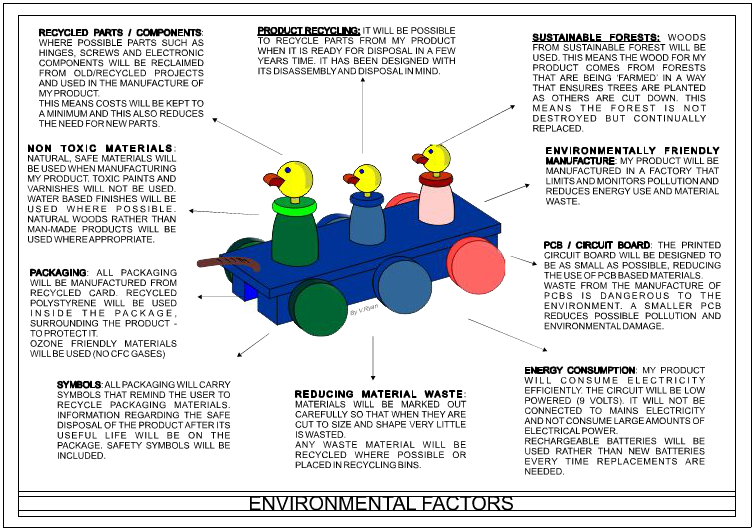 Mention why it is important to keep environmental issues / aspects in mind when designing and manufacturing a product. 5. Refer to the fact that it is well known that the general public care about the environment and that they treat environmental issues very seriously. 6. 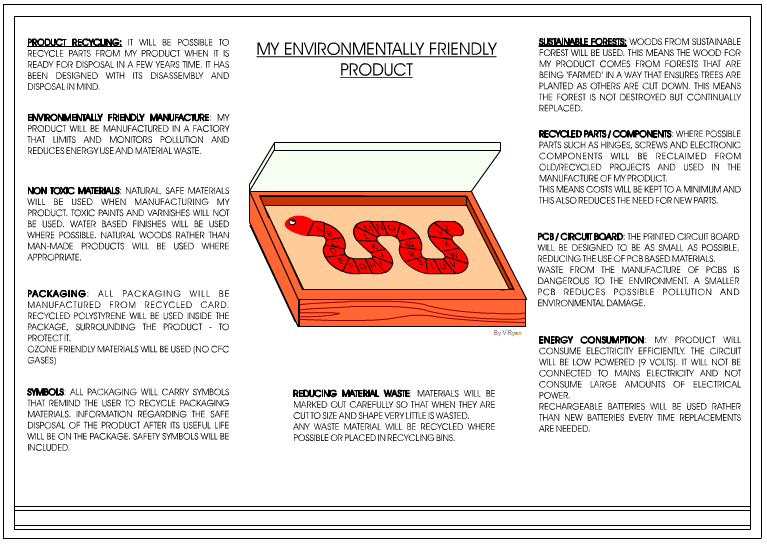 State the fact that designing and manufacturing with the environment in mind is a good sales point. Customers are more likely to buy your product as it is environmentally friendly. 7. Mention that using materials without considering reducing waste will lead to your product being more expensive as more materials will be needed to make it. 8. Remember, saving energy, reducing waste etc... is all part of careful planning and shows concern for the environment and your business sense. B. Do not copy statements/sentences from other pupils, use your own words. Look at the work of other pupils and adapt rather than copy. C. Carry out research on the environment and be prepared to spend time on your work. D. Ask the teacher for advice and look at completed projects for more information on the environment.